HELP CREATE A VOLUNTEER WORD CLOUD! For two months, subscribers to e-Volunteerism have read and responded to something out of the ordinary. 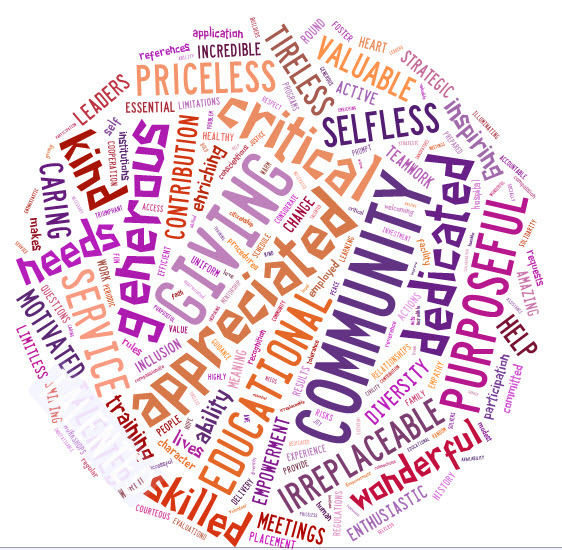 The article, Help Us Create a Volunteer Word Cloud!, asks readers to submit the words they think of the most to describe volunteers and volunteering. The plan is, collectively, to produce a "word cloud" to visualize the concept. With one month to go in this issue, we are opening the article up to welcome input from everyone, whether or not they subscribe to the journal. Here's one word cloud we formed from responses to date. Keep the process going and add your favorite descriptors. At the end of October, we'll create and share the final word cloud that you can print as a mini-poster or save as desktop wallpaper. To our international readers: Feel free to submit words in languages other than English. This will only make the cloud more interesting. Click here to learn more and get to the submission form. When is the last time you reviewed your policies about volunteer management procedures? Do you follow protocol in screening potential volunteers? Are paid staff members informed about how to deal with troublesome behavior from a volunteer? Are volunteer handbooks up to date? Schedule time in the next four months to review organizational policies related to engaging volunteers and start 2014 off with a fresh perspective. Don't forget to solicit advice from the executive director and the board to promote the fact that safe, responsible volunteer involvement is everyone's responsibility. For help, visit the Energize Online Bookstore for books related to creating policies about volunteer involvement. Volunteering Through the Eyes and Ears of a Dedicated Dog Volunteer (Volume IV, Issue 1, October 2003). Mikey, a 13-pound Shih Tzu, shares his considerable experience in various volunteer roles (all through the voice of his "pet person," Charles Stallings). Charming and humorous, this unusual perspective provides insights into what any human volunteer might encounter, too. Exploring the Academic Archives and Beyond: Research Can Be Your Friend - Janina M. Fuller presents a practical approach to mining scholarly literature and to finding colleagues in academia to create partnerships to expand your research horizons. Jump on the Intern Bandwagon - Given the unpaid internship controversy discussed in this issue's Points of View, Linda Miller's Training Design offers just-in-time guidance on how to develop solid internship positions. Volunteering as Producer of Social Capital and Well-being - Along the Web co-editor Arnie Wickens explores the growing body of research proving that volunteering is good for society as a whole and that it needs to be nurtured and fostered. We'll finish our volunteering word cloud! (See above.) This issue remains current through October 15.